Recently, Rockstar debuted the first trailer for Grand Theft Auto V. As is the case with most Rockstar trailers, it doesn't say much about the game's story or mechanics. Instead, like most modern Rockstar trailers, it focuses on introducing themes and setting the game's tone. After watching it, I took a quick trip down memory lane to compare the GTA V trailer to some of those made for the previous games. What I found happened to offer some insight into the last GTA game I played, GTA: Chinatown Wars. GTA: San Andreas was the last hurrah for the PS2-era GTA games. The trailer wasn't as cinematic as subsequent ones would be, but it demonstrated how far Rockstar had come in terms of creating open worlds that possessed both distinctive settings and time periods. Everything from the color palette, to the music, to the on-screen action sets up San Andreas as a sprawling period piece. The smoggy orange-and-brown hue of fake California and early 1990s hip hop draw inspiration from real places and the culture associated with them. Images of metropolitan sprawl and young black men clashing with police position the game as a broad take on relatively recent history. While you'll probably only control one character, the game is about more than an individual. It took advantage of the more powerful hardware to draw clearer links between our world and GTA's fantasy environment. Everything from the geography to the textures mimicked New York. The tone of the trailer adopts a more sweeping scope. The operatic score suggests a darker story, and Nico's narration is serves a dual purpose. It introduces his personal plot, but also speaks to one version of the American immigrant experience. GTA IV is presented as more than a story about one man trying to start over: the trailer taps into larger issues and hints at whether starting over is even possible. GTA IV is a darker, more realistic shadow version of our world. All of this makes GTA: Chinatown Wars seem like departure. A few months back, I played through Chinatown Wars and, while I enjoyed elements of it, the overall experience felt somewhat generic. The trailer encapsulates several reasons I found this to be the case. As shallow as this may sound, I think GTA as a franchise has moved past stylized graphics. Thanks to the limitations of the hardware, characters and environments take on a cartoonish quality. Huang and the crooks he deals with start to resemble actual stereotypes rather than satires; the dumpy corrupt cop, the hot-tempered family scion, the Chinese dragon lady, and the evil Confucian kingpin seem too archetypal to succeed as satire. The text frames the story as a more narrow, personal tale. Huang goes on about his personal quest for vengeance, his own family's honor, and his personal relationship to the criminal underworld. The trailer gives us little indication as to how his story fits into the larger society. True to its name, Chinatown Wars is made to feel like a parochial conflict off from the Liberty City saga. Unlike GTA: San Andreas and GTA IV, there is little commentary on the American cultural experience; this is just a private little war. The entire package seems more detached than the previous two games. The game is defined by its traditional camera angle: instead of being immersed in a world at the street-level, you look at everything as a distant observer. From this perspective, Liberty City loses some of its distinctive atmosphere, and the characters become flat props used to cram in unimaginative jokes. It doesn't help that these supposedly Chinese gangsters often lapse into British-isms (hearing Triads say things like "buggered" and vowing to "Get this situation sorted" is jarring). This isn't to say that the game wasn't enjoyable. I have probably spent more time with Chinatown Wars' drug dealing simulator than with all other side quests/mini games in all other GTA games combined. 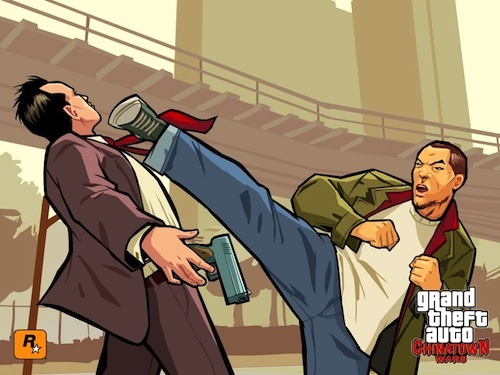 The mayhem, humor, and violence that define GTA is still present, but the cultural relevance and high production values that have come to define the series is missing. If this clip is any indication, GTA V is a return to form. Dramatic music, bold cinematography, and a layered message suggests that Chinatown Wars' small scale was a momentary diversion. The narrator's story of chasing the westward dream seems realistic on both personal and social levels. For years, people have dreamt about starting anew in California, only to realize that their old problems followed them and that new problems were waiting. Maybe it's fitting that GTA V is returning to its own twisted version of Hollywood. Chinatown Wars, a game that resembles GTA's beginnings now seems out of place next to the glamorous console productions. If its reception was any indication, people aren't interested in a visually simple, top-down GTA, even if it has most of the mechanical trappings of its big-budget brothers. It's no longer enough to let players steal cars, GTA has to walk the line between crude humor and sharp social commentary, all the while keeping with the visual styling of a Hollywood blockbuster. The internet has already been busy so some dudes reimagined the GTA5 Trailer in San Andreas. Impressive as to how far Rockstar has come fro a visual perspective.